A reminder of the serious penetration of our system by suit-wearing jihadis. 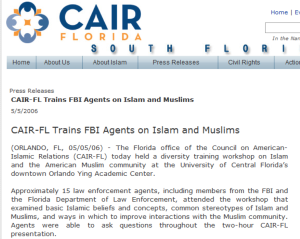 Remember this is much more a counterintelligence and espionage problem than merely a “terrorism” issue. 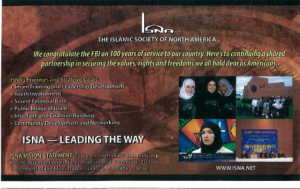 FBI recruits FBI agents in ISNA’s Monthly Magazine. 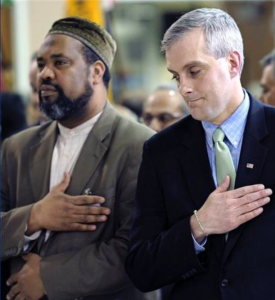 The US Gov’t identified ISNA as a Muslim Brotherhood organization which funds the terrorist group Hamas. 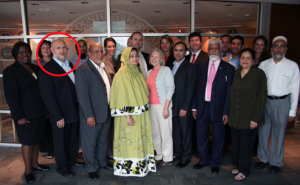 The largest terrorism financing trial ever successfully prosecuted in American history identifies ISNA as a Muslim Brotherhood organization funding the terrorist group Hamas. 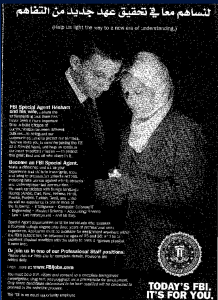 The FBI allowed them to take out a half-page ad in their 100 year anniversary magazine. 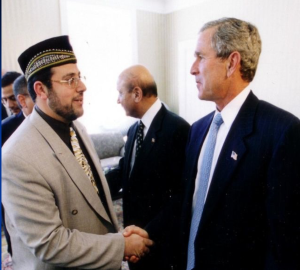 Republican strategist Grover Norquist founded the Islamic Institute with $10,000 from Al Qaeda financier Alamoudi with Alamoudi’s deputy Khaled Saffuri. 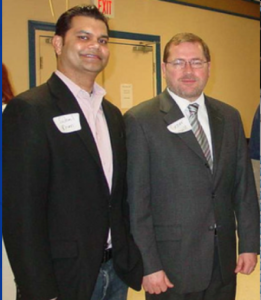 Norquist also supported/promoted Suhail Khan, son of one of the most prominent U.S. Muslim Brotherhood leaders – Mahboob Khan. 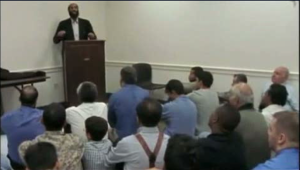 Al Qaeda leader Anwar al Awlaki taught muslims inside the U.S. Capitol about Islam’s prophet Mohammad, led prayers in the Capitol, and briefed government officials in the Pentagon. 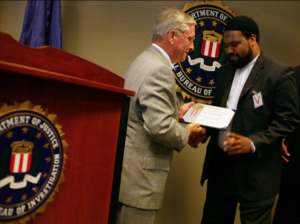 2005: FBI Special Agent in Charge of the FBI’s Washington Field Office Mike Rolince gives award to Imam Mohamed Magid (left). 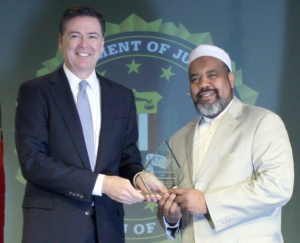 2016: FBI Director James Comey presents the FBI’s Director’s Award to Imam Mohamed Magid. 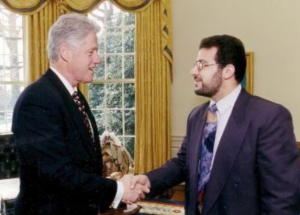 Magid was the VP and President of ISNA. 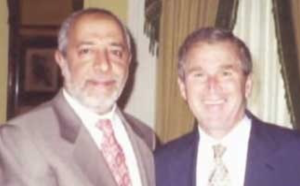 Evidence in the largest terrorism financing trial in U.S. history (US v HLF, Dallas 2008) identifies ISNA as a Muslim Brotherhood organization which funds the terrorist group Hamas. This trial was the result of a 15-year FBI investigation. 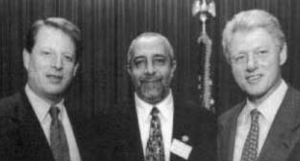 President Clinton (left) and President Bush (right) with Imam Yahya Hendi of the Fiqh Council of North America. 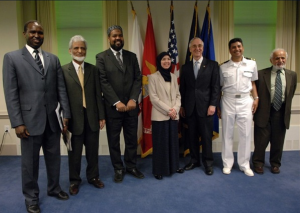 Evidence in the largest terrorism financing trial ever successfully prosecuted in American history (US v HLF, Dallas, 2008) reveals the Fiqh Council was formed out of the Muslim Students Association and ISNA. 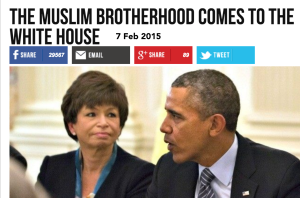 All three are Muslim Brotherhood organizations. 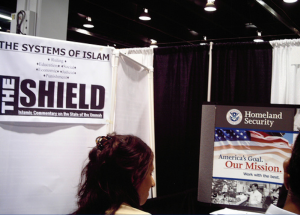 Department of Homeland Security recruitment table at ISNA conference, next to jihadi organization Hizb u Tahrir table. 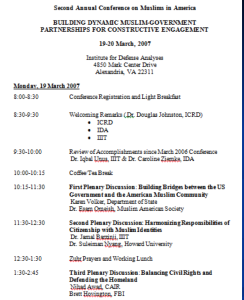 Reminder: the U.S. government identified ISNA as a Muslim Brotherhood organization funding the terrorist group Hamas. You cannot make this stuff up. 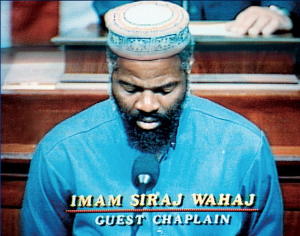 Imam Siraj Wahaj was the first muslim Imam to offer prayers in the U.S. House of Representatives – he was an unindicted co-conspirator in the 1993 World Trade Center bombing. 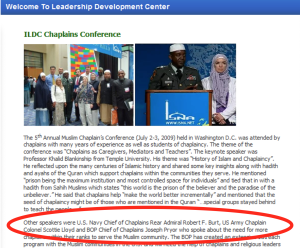 Leaders of Military and Bureau of Prison Chaplain programs work with Muslim Brotherhood and terrorist financing organization ISNA. 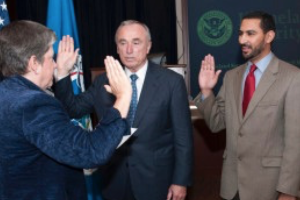 Homeland Security Secretary Janet Napolitano swears in Muslim Brother Mohammed Elibiary, one of the speakers at an event in Texas celebrating the Ayatollah Khomeini, and gave him a Secret Clearance. 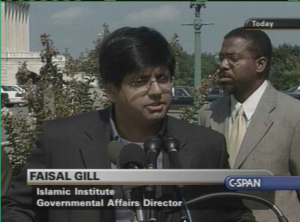 Elibiary openly calls for sharia in the U.S., and was later fired by DHS. Secretary Napolitano defended Elibiary during testimony before Congress despite the fact Elibiary used law enforcement sensitive data in an attempt to use it to politically harm then-Governor Perry. President Obama and senior administration officials met with Muslim Brotherhood leaders and supported the Muslim Brotherhood in Egypt calling for the overthrow/removal of sitting Egyptian President Hosni Mubarak. 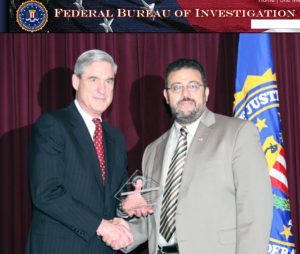 U.S. Muslim Brotherhood leader Louay Safi was the President of IIIT and AMSS, and worked for ISNA’s Leadership Development Center which certifies Muslim Chaplains for the military and Bureau of Prisons. 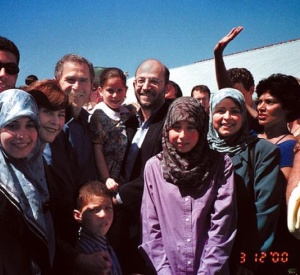 Now he is a leader in the Muslim Brotherhood’s Syrian National Council in Syria. America, remember when Congresswoman Michele Bachmann called for Inspector Generals in the U.S. government to investigate the Muslim Brotherhood’s penetration in our system, and it was John McCain, John Boehner, Marco Rubio, Scott Brown, Mike Rogers and others who aggressively and publicly chastized her? The swamp is huge and full of evil, slimy things. I pray our new administration has hip boots and huge nets. We are in a War and refuse to admit that we are. 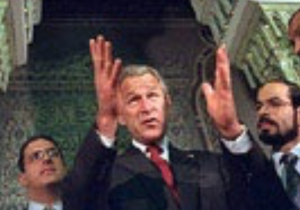 Will try to emphasize the “stab” treason of e`stab`lishment RINO/ROTT republicans myself whenever possible. Songbird McCain and Robert Mueller should be shot. You know what pisses me off almost as much as Islam – wanting to financially support your excellent work and not being able to find a goddamn Donate button! Sheesh! Did the jihadis design your site? Since thanks mainly to the smiling dozen or so of seditious American quislings. 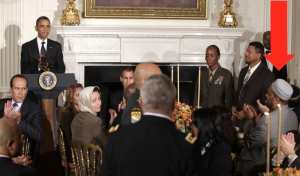 pictured above among others as they bestowed accolades of endearment and other awards on prominent representatives of their ever expanding allied hoard of ideologically-driven sharia-adherent Islamist killers who seek our destruction, the country is perforce now engaged for the 2nd time in American history in a war* with Islam involving U.S. Constitutional as well as personal survival. I..e., the U.S.- Barbary pirates (Islamist) war ended on 21 May 1805 to the astonishment & horror of the Islamic “Bashwa” of Tripoli when heavily fortified Derna, Libya fell in less than three hours to a small detachment of United States Marines and mercenaries led by USMC First Lieutenant Presley O’Bannon. (RIP). 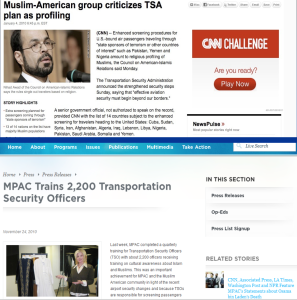 Furthermore, federal & domestic law-enforcement, as well as national security related entities, continue to be significantly undermined due to the U.S. Civil Service Commission’s apparent discriminatory campaign, presumably at the behest of said quislings, to ensure preferential employment opportunities for said sharia-adherent killers. 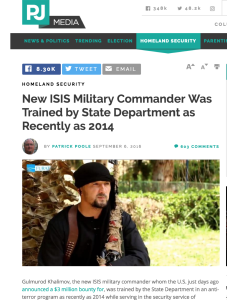 Which, with respect to preventing Islamist terrorist attacks in the country is tantamount to nominating Lepke Buchalter of Murder Incorporated to become the role model of the Boy Scouts of America. 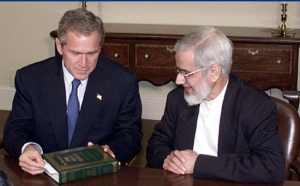 *Anyone who wishes to own a personal copy of the Arabic-to-English translation of Islam’s comprehensive declaration of war on the United States (in their own words) the original of which was seized by Special Agents of the FBI from a subterranean basement in Annandale, Virginia in compliance with a federal search warrant, in 2004, may do so (for a nominal handling & postage fee) by contacting: http://www.securefreedom.org to request: GOVERNMENT EXHIBIT 003-0085 3:04-CR-240-G U.S. v. HLF, et al.